I fell in love with Corsica at first sight. Maybe it was something to do with leaving London on a grey, sleety February morning and arriving in Ajaccio to find spring sunshine, a blue sky and flowering almond and mimosa trees. It was irresistible and I was enchanted. Um, I know that feeling. Don't you? So begins chapter seven of Rosemary George's classic book French Country Wines, entitled "Wines of Corsica" and full of interesting anecdotes about the island of beauty, or "the very beautiful" as she translates the Greek name Corsica Kalliste. I love that, "the very beautiful." Before remembering and revisiting this chapter in a book that I've long owned, before this year's Tour de France spent its first few days on the impossibly gorgeous island, before I realized what I was doing, I declared this the summer of Corsica. You know, #summerofCorsica. As someone replied to me on Twitter, the summer of Riesling is so 2009. Fear not Riesling fans, the #summerofCorsica hasn't caught on. And to be sure, Corsica shouldn't be limited to just summer. The warm island produces fairly full bodied wines that don't necessarily say summer. The Roses of course are summer fare. The whites too. But both, and certainly the warm, sometimes a bit roasted reds, can shine all year round. Prepare for the #autumnofCorsica" and certainly the #winterofCorsica, when we in the northern climes could use some of that summer sun in a bottle. For now, it's summer and I'm working my way through the wines of several of the better producers from the very beautiful. I'll report further when I've made it through more of the wines, but so far, I am in fact enchanted. And I don't expect that to change. Some things just are. People always ask the most interesting - and often hard to answer - questions about the winemaking process. I love that they're so interested, but I wonder if my answers satisfy. Where is your vineyard? I don't have one, but I work closely with growers. Where is your winery? I don't have one, but essentially rent space in a shared facility. I thought you said you were a winery, how's that? A winery is a business, and a winery is a facility. I have a winery business but rent space in someone else's winery facility. Blah, blah, blah. Some questions can annoy, even if they shouldn't. When do you put the pepper into the wine to get this peppery flavor? I taste blueberries - when you put those in? I practice being patient and friendly in these situations. People just don't know much about something I'm totally obsessive and geeky. Doesn't make it easier though. And there are questions that I never thought I'd get (I'd heard about the added flavor questions from friends). The one that I think about the most? When. When is it time to bottle the wine? And how do you know when it's time? Good questions. Some things you just know. One, that something is good. Two, that it will go into bottle as a particular cuvee. Three, that there are no deadlines in winemaking, but there are reasonable conclusions we can make about what and when certain things should happen. When is a wine ready? When it's ready. That is, when it's done with its chemical changes through two fermentation processes, when it's fallen clear (or mostly clear anyway), and that it's ready to begin consuming or begin its continuing maturation in a glass bottle, or both. In short, when the particulars are established about the quality, stability and clarity about a wine, it's at least close to time. 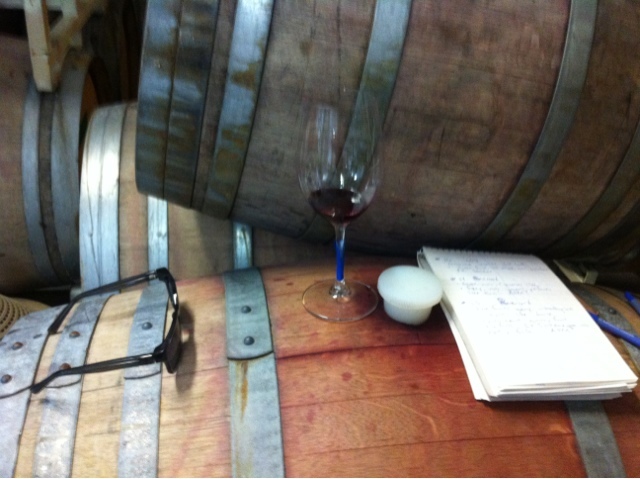 For me, wines go to bottle after about a year of maturing, after careful evaluation of each barrel. Over time I'd like to experiment with holding some wines in cask longer. For now, I know this - the time is close. And I'm very excited.